A lot of houses were for sale, and the town seemed infected by an unearthly quiet. And then, on Hannah's first day of classes, she ran into a group of cheerleaders — the most popular girls in school. I'm of two minds on this one. On the one hand (or in the one mind, if you will), it was pretty fun and I caught little glimpses of something bigger that I think James was going for, a sort of social commentary/satire-ish piece on being a sheep, going with the crowd, lack of individuality, etc. (I think; maybe I'm just reading way too much in?). But on the other hand, it didn't quite come together for me. Like I said, I wasn't sure if I was just reading too much in and hoping for clever; this maybe is because there was just something lacking for me in Hannah. If it was skewering popularity and group-think, I would have expected a little more commentary from Hannah and the narration (sarcastic or otherwise) that would make it clear. Or just...something. It was a little muddy. I think too, that part of what I felt lacking was that I didn't really connect to Hannah. I mean, I wanted to; I got why she became so focused and fixated on becoming a cheerleader. She wanted stability and acceptance and some sense of normalcy (ironic, considering). But I still needed to like her, and in the end, I just didn't. I didn't dislike her, either, and find her an anti-hero, which would have been fine. She just was, and she made some lousy choices in a really weird situation, and I couldn't put myself in her place and go with it. Which is the crux, I think, of the whole story. While it was fun, and I wasn't one of those who was angry with the ending, I just never was able to let go and go with it. But like I said, I saw things in it that I did enjoy, and that made me just wish for a little more. Though that in itself is disappointing, it also means that there is something there that's making me feel and want. I did like what James set up in this story, and some elements were really well done indeed. The town is creepy and the cheerleaders even more so. This was the best part of the commentary (?) for me, because, setting aside that yes, they are zombies, they all look exactly alike. They all change their names to start with the same letter. They exhibit this crazy mass group-think thing that has the town captivated, and that makes for some great creepytime. 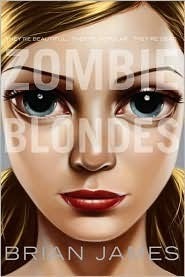 All in all Zombie Blondes ends up being caught in the middle somewhere between being fun and being meaningful, and though it may not completely work on that level, it does work as a light Halloweeny zombie read, enjoyable so long as you don't let yourself hope for too much more. And it has a flipping fantastic cover. Thank you for your review! I don't know if I'm going to read this very soon, but maybe I'll give it a try in the future.